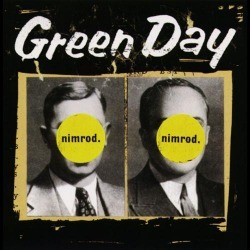 Nimrod is the fifth album by the Rock band Green Day, released on October 14, 1997 on Reprise Records. The album entered the BillboardU.S. charts at #10, and achieved double platinum status, although it did not revive Green Day's sales to the level of Dookie. Nimrod achieved critical respect and yielded the acoustic hit "Good Riddance (Time of Your Life)." The album was released in Europe as an HDCD. The album has sold over six million copies worldwide. The portraits covered on the cover are Dwight Eisenhower and Harry S Truman.